who turned out the lights?!? Luckily I took pictures of the brewery banners for the beers I liked, because I’d never remember them otherwise. I do have to give a special shout out to Kristen at Baby Brewing for giving me an awesome “Daddy needs a beer t-shirt” in exchange for one of my pretzels. 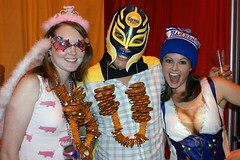 We found each other on twitter before the Great American Beer Festival when I posted pics of my pretzel necklace. 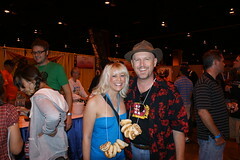 I found her booth during the night, gave her a pretzel based on the awesome pretzel recipe from BeerSmith’s website, and I scored a cool t-shirt. Who says Twitter isn’t great for networking!! If you haven’t seen her shirts, you should go check them out. They also have very cute shirts for the girls too! Most of what you remember in past years was still there. 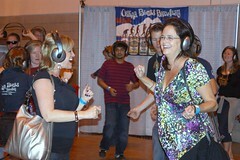 They continue to have the Silent Disco (a cute joke years ago). They also had cooking presentations, but the festival is so large I had difficulty finding anything other than beer. Luckily the beer is what I was there for! I laughed hard when I saw this ad. I thought this was the most unique form of advertising I saw at the show. 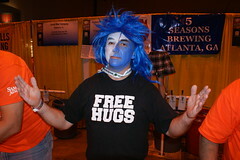 I don’t think too many of the women saw this one, unless they were hitting the whiskey barrel brews more than I was! 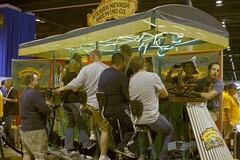 Kudos to Cascade Lakes Brew for this clever ad. The costumes at the show are getting fewer and fewer. I’m not sure why this is. My guess is the number of attendees is growing each year, which makes it harder to find the people wearing costumes. Well these are better late than never, right? 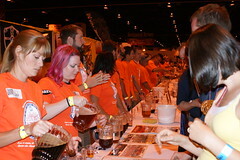 Here’s what you missed at the 2010 Great American Beer Festival.